On October 3, the U.S. bombed a hospital run by Doctors Without Borders, (MSF), the Nobel Peace Prize-winning humanitarian group, in Kunduz, Afghanistan, killing at least 30 people. 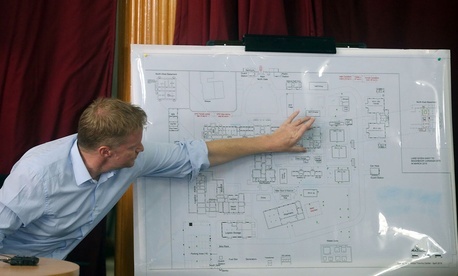 In the aftermath of the bombing, MSF called for a never-before-used mechanism of the Geneva Conventions to investigate the strike, and General John Campbell, the senior-most U.S. commander in Afghanistan, said the “hospital was mistakenly struck”—an apparent evolution of the U.S. position on what happened that day in Kunduz. The bombing came amid the backdrop of the Taliban’s capture—since reversed—of Kunduz. It was the Taliban’s biggest prize since the U.S.-led invasion of Afghanistan ousted the militant group from power. The fighting was bloody and the civilian toll high. Many of the injured—civilian, Afghan military, and Taliban—were treated at MSF’s Kunduz hospital. The report detailed the week prior to the U.S. attack, starting September 28, when the MSF team launched a mass-casualty plan to receive an expected large number of people wounded in the fighting between the Taliban and Afghan forces. The next day, September 29, MSF says it informed the U.S. and others of its exact GPS locations because fighting had intensified. On October 2, the night of the airstrikes, two MSF flags were placed atop the facility, which was one of the few buildings in Kunduz still to have electricity. A nightly security check, conducted shortly after midnight, found the area “calm.” And, the report appeared to dismiss Afghan government claims that the hospital complex was being used by the Taliban in their fight. The attacks began between 2 a.m. and 2:08 a.m. on October 3, the MSF report said. At the time, the hospital was treating 105 people. Between three and four were government combatants, MSF said. About 20 were wounded Taliban. Also present: 140 MSF national and nine international staff, and one delegate from the International Committee for the Red Cross. The airstrikes continued for a little more than one hour, and ended between 3 a.m. and 3:15 a.m., the MSF report said. In Washington on Thursday, Captain Jeff Davis, a Pentagon spokesman, said MSF had shared its report with the military. You can read the full MSF report here.